PVC stabilization, the most important aspect of formulation and performance of this polymer, is discussed in details. 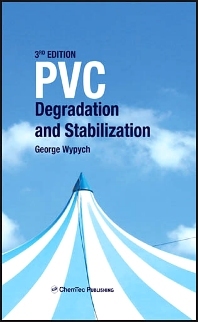 This book contains all information required to design successful stabilization formula for any product made out of PVC. Separate chapters review information on chemical structure, PVC manufacturing technology, morphology, degradation by thermal energy, UV, gamma, other forms of radiation, mechanodegradation, and chemical degradation. The chapter on analytical methods used in studying of degradative and stabilization processes helps in establishing system of checking results of stabilization with different stabilizing systems. Stabilization and stabilizers are discussed in full detail in the most important chapter of this book. The final chapter contains information on the effects of PVC and its additives on health, safety and environment. This book contains analysis of all essential papers and patents published until recently on the above subject. It either locates the answers to relevant questions and offers solutions or gives references in which such answers can be found. PVC Degradation and Stabilization is must to have for chemists, engineers, scientists, university teachers and students, designers, material scientists, environmental chemists, and lawyers who work with polyvinyl chloride and its additives or have any interest in these products. This book is the one authoritative source on the subject.